How to Preserve the Catholic Family? Our subject on How to Preserve the Catholic Family deserves more than a single conference. It deserves not only an hours reflection but a lifetime of prayerful meditation. Nothing less than the survival of the Catholic Church in one country after another is at stake. Anyone who has any knowledge of the modern world realizes that the family in one country after another is in deep trouble. Nothing less than the survival of whole nations is at stake as we see family life disintegrating. There are tens of millions of abortions annually throughout the world; and, by now, scores of millions of people are living in what we call broken marriages, which means broken families. There must be some deep reason for this catastrophe. There is. The disintegration of the family, in one Western nation after another, is the result of disintegration of Christianity in these societies. As a once-Christian nation becomes de-christianized, the family in these nations begins to break down. The breakdown of the family in once-flourishing Christian countries is the consequence of a de-christianized society. What then is the solution? It is obvious. Restore authentic Christianity and you will restore family life. At this point, I will do something very unusual. I will restate our title, How to Preserve the Catholic Family. The restatement says, Either Stop Contraception or Destroy the Family. Why this restatement? Because contraception is the single most devastating cause for the breakdown of the family in the modern world. God in His mercy allows evil that greater good may come as a result of the evil. He has allowed contraception to plague the modern world so that we may repent and return to our Fathers house. I have deliberately restated the title of our conference in uncompromising language. This is a warning to all us, married and single, the laity and the clergy, bishops, priests, deacons and religious, parents and children. Why do I say this? Because in greater or less measure, it has been the infidelity of so many professed Catholics in every state of life, which has contributed to the disappearance of the family in once Christian cultures throughout the world. My plan is to cover several aspects of this historic subject. There will be a series of statements followed by clear explanations, and then what I hope will be an uncompromising conclusion. Since the Incarnation, Christianity is the foundation of the family. Contraception undermines the foundation of the family. To preserve the family, Christianity must be restored in the modern world. What makes it sound strange is that the coming of Christ is so widely underestimated. When God became man, He did more than die on a cross to redeem a sinful world. By His Incarnation, the God-man revealed to the whole human race such truths of faith and morality as had never been known before since the beginning of the world. Among these truths which the Son of God revealed, the central truth was the truth of love. That out of love, God became man to die for us and gives us the privilege of dying to ourselves out of love for those whom He places into our lives. 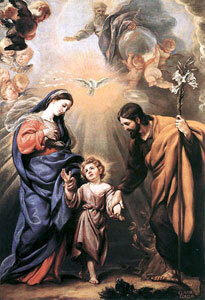 It was not coincidental but divinely ordained that, when God became man, He became a member of a family. It was divinely ordained that the Incarnate God made monogamy binding on all His married followers; one man with one woman, faithful to each other in marital chastity until death. It was divinely ordained that Christ should have instituted the vocation of celibacy of consecrated chastity. Why? To show His married followers the power of divine grace in controlling the desires of the flesh. It was not coincidental but divinely ordained that His followers would master even their disorderly thoughts and sexually perverse desires. So far from taking back the Old Testament precept to increase and multiply, the Savior told His followers to let the children come unto me, for to such belongs the kingdom of God. Indeed, we adults need children to become as little ones in humility and thus enter the kingdom of heaven. How, then is Christianity the foundation of the family? It is the foundation of the family in teaching and providing grace for the practice of selfless love. Without love, the family either does not exist; or if it exists, it will be destroyed. Those who practice contraception can be militant in their claim that contraception does not undermine the foundation of the family. The pressure of conformity to the practice of married people in todays society. The economic pressure of keeping up ones standard of living with each additional child. The social pressure of being told by other married people, What, another child?  as though the pregnancy of a wife was something out of order, or motherhood a liability on society. The political system of a nation, which discourages larger families and penalizes those who have children. In Russia, during the seventy years of Communist occupation, the average number of abortions each year was sixteen million and houses were built like prison cells, to house no more than two children per couple. Now in Red China, the law forbids a woman having more than one child. The social structure of a nation, which favors feminism, discourages women from having children so they can be productive for the people. Thus in our country, the majority of employed personnel in every sector of business and industry are women. This works havoc with even wanting a family. It encourages late marriages with their high percentage of sterility. At the root of these factors which undermine the family is the contraceptive mentality. In order to bring out in stark contrast, the teaching of Christ on selfless charity and the selfish philosophy of the contraceptive mentality, it will be worth looking at each with absolute frankness and sincerity. This is my commandment, that you love one another, as I have loved you (John 15:17). Greater love than this has no man than this, that he lay down his life for his friends (John 15:13). These things I command you, that you have love for one another (John 15:17). By this, He tells us we shall all now know that we are Christs disciples, if we have love for one another. So literally did the early Christians take Christs teaching that this selflessness which they had for one another was the single principal reason for the miraculous conversion of so many pagans to Christianity. One thing should be added, however, the selfless love of the early Christians was especially manifest in their strong family life. Do I say strong family life? There was no family life until Christianity began to convert the Roman Empire. As Christianity took root, not only contraception disappeared among the followers of Christ, but abortion, and divorce, and infanticide. The verdict of history is absolutely clear. As Christianity, true, honest to honest Christianity takes root among a people, contraception and allied evils are removed. Why? Because, as Christ tells us, there can be no compromise between Him and the world. We either accept Him and reject the contraceptive selfishness of the world; or we give in to the seductiveness of the world and write books defending contraception as just another moral option. For anyone who really believes in Jesus Christ, contraception is a mortal sin. In contradiction to the teaching of Christ, the contraceptive mentality sees nothing wrong in artificial birth control. Once Christianity was established in the Mediterranean World, the practice of contraception  along with abortion and infanticide  ceased among believing Christians. This for the best of reasons: because from the first century of Christianity, already by the year 90 A.D. contraception was denounced by the Church as a grave sin against God. For the next eighteen hundred years, even among those separated from Rome, contraception was generally forbidden until the present century. Then two things happened. A chemical means of preventing conception was discovered, and the protestant Church of England approved contraception for its members. Given the tremendous influence of Anglican Protestantism on Anglo-Saxon Catholics, before long many Catholics began to practice contraception. By 1968, the situation became so grave that Pope Paul VI issued in July of that year his historic encyclical Humanae Vitae, condemning contraception. This was right after the close of the Second Vatican Council. Dissenters from the Churchs teaching erroneously used the Council to support the idea of bishops being independent of the Pope. When Humanae Vitae was published, the bishops conferences of most countries throughout the world met to vote on the binding character of Humanae Vitae. About half the bishops supported the Pope while another half did not. Among the countries whose bishops left contraception open to the consciences of the people were the United States, Canada, France and Germany. Inevitable the faithful in large parts of the Catholic world were confused. The world is becoming over populated. The alleged under-developed countries must be kept from growing in numbers, by contraception, sterilization and abortion. The only world representatives at Cairo to oppose this contraceptive homicidal plat was the Vatican and its efforts were successful. This in spite of the massive media opposition, all in favor of contraception and abortion. All that we have said so far leads to a sobering conclusion. The propagation of Christs teaching in todays world is imperative as never before. What am I saying? I am saying the day is gone when we can think of evangelization as something merely good. Oh no! Evangelization of the world, including our own American world, is a dire necessity. With the spread of the contraception plague and its murderous consequences, we see something more evil taking place in our day than ever before. We see whole nations losing their grip on sound morality, and even the rudiments of the natural law. Whole countries are going morally insane in their ethical thinking, as seen in the irrational laws they make to bind their people contrary to the most elementary prescriptions of the living God. In the early Church, Christianity was given a name that is all the more meaningful today. Christians, it was said, are the soul of the world. In Latin, Christiani sunt anima mundi. So we are. And we had better wake up to our God-given responsibility. That is why God became man, as St. John tells us, He is the light of the world. He is the life of the world, He is the truth without whom the world is walking in darkness and the shadow of death. But Christ tells us that we are to bring His light to the world. We are to provide His life for the world. If we do, and in the measure that we do, we shall restore stability and peaceful unity not only to our families, but to our parishes and dioceses as well. Where a person stands on contraception is a good test of his authenticity as a Catholic. The reason, as we have seen, is that at the root of the evil of contraception is selfishness. But the foundation of Christianity is the love of others out of love for God. I am almost finished, but not quite. All of us, young and old, bishops, priests, clerics, religious and the laity have one basic obligation in life: to grow in the likeness of Christ by following His example of selfless charity. We are truly followers of Christ, as genuine disciples of His Gospel, as really in love with Him  as we love the crosses He puts into our own lives, which generally have peoples names! We began this conference by asking, How to Preserve the Catholic Family? We are now ready to give an answer. To preserve the Catholic family, those who profess to be Catholics must live selfless lives. Husbands and wives must exclude contraception from their marital relationship. They must see in every child that God wants to send them as a gift of His love. They must see themselves as preparing their children for the heaven where there will be no longer any marriage or giving in marriage. They must see their families as struggling in this valley of tears in order to be reunited, as families, in that celestial home for which families are brought into this world. They must live nothing less than martyrs lives in giving witness to their love for God. They not only accept the children He sends them, but they inspire these children with the meaning of true love, which is a life of self-sacrifice inspired by the God who became man to die on the cross out of love for us. Lord Jesus, teach us the hardest lesson in life we have to learn, to love others as you have loved us. This means that, we accept suffering for others, even as you chose to suffer for us.